Within 60 days Nissan will have "a lot of Quick Chargers in the ground" at Nissan dealerships, in a big vote of confidence in Nissan's choice to use the CHADEMO standard for quick charging. The statement was said by Tim Gallagher, Nissans Western US Manager of Corporate Communications during an appearance at the SF BayLEAF's and GGEVA meeting on Saturday, in San Francisco. The appearance was part of a small tour in which Gallagher brought a preproduction 2013 Leaf to a few locations in the SF Bay Area, giving Leaf fans a chance to look at it and talk with Nissan representatives. This is an interesting strategic move on Nissan's part because of the longer term standards battle over fast charging standards. With CHADEMO fast charging, a Nissan LEAF can pick up an 80% recharge within a half hour. 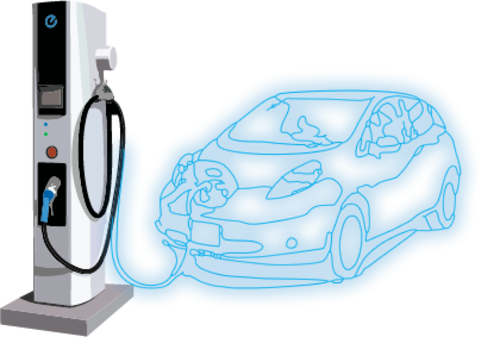 Faster charging radically changes the usability of an electric car, and while the 6.6 kilowatt charging support in the 2013 model will be a boon to 2013 LEAF owners, fast charging is much much faster. On the LEAF the range boost is 50-60 miles worth of range in 20-25 minutes, versus the 25 miles of range per hour of charging at 6.6 kilowatts or 12 miles of range per hour of charging at 3.3 kilowatts. The automobile industry had been locked in a standards battle between CHADEMO and SAE's DC Fast Charging system. An example of that battled occurred last May, at a public hearing convened by California Senate Majority Leader Ellen Corbett to discuss Electric Vehicle Deployment. During the meeting Nissan and GM representatives traded barbs over fast charging standards, with GM's Shad Balch pressing Sen. Corbett to use public funds only for standardized fast charging systems. The SAE DC Fast Charge system has long been expected to be officially approved by the SAE J1772 committee, due to their long-running snubbing of the CHADEMO standard, and indeed the SAE fast charge system was approved in October 2012. Nissan, however, is undeterred in pushing for CHADEMO adoption and deployment. This writer spoke with a Nissan representative on this in October, and he explained that Nissan is looking to get a lot of CHADEMO cars into the field essentially establishing it as a de facto fast charge standard. In that regard it's a numbers game, because it will be a couple years before large numbers of electric cars with SAE DC Fast Charge ports are being sold, and in the meantime Nissan is ready to sell large numbers of LEAF's in both North America and Europe, many of which will sport CHADEMO ports. The charging stations will be installed at Nissan dealerships, and the intention is that they will be available for use 24/7. Additionally, the stations should be available to Mitsubishi i-MiEV owners, the other electric car that has a CHADEMO port. Rather than deploy the charging stations from vendors like ABB or Schneider, the equipment Nissan will deploy is the inexpensive CHADEMO charger design that Nissan developed on their own. That charger was developed in collaboration with Sumitomo, and has a starting price around $15,000. Nissan already has deployed Level 2 charging stations at dealerships, making those stations available to the public. Adding fast charging stations is simply part of that same effort. It was unclear whether there will be a fee for using the stations. The existing stations at Nissan dealerships are free, but fast charging carries additional costs including demand charges from the power companies that can be significant. The quick charge port built into most LEAF's (and i-MiEV's) is only useful if there are enough CHADEMO charging stations installed. Otherwise it's just a useless power port, just like that Betamax VCR gathering dust in your basement also proved useless over time. 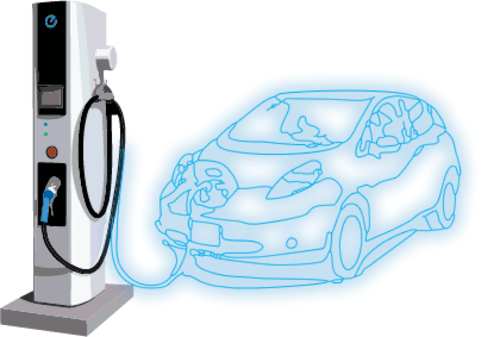 What Nissan is getting ready to do is install enough CHADEMO charging stations so that the LEAF fast charge port has more value. That should in turn help to goose LEAF sales, by making sure the fast charging feature LEAF has actual value. Other than Mitsubishi and Tesla Motors, no other electric automaker has a fast charge feature. The first electric car to be offered with the SAE DC Fast Charge system is the Chevy Spark, the 2014 Chevy Spark EV is due to go on sale in limited quantities in the Summer 2013. Nissan could be far ahead in fast charging deployments by the time the other automakers get the ball rolling with the competing system. Don't buy an EV because they promote free charging. It's very likely to be temporary to sucker people to buy their vehicle then they switch policy on you at a later date to no longer be free. Especially for those that have bought or lease their Nissan leaf, it appears Nissan is no longer offering free quick charging to existing leaf customers around my area in CA. Even at my local Nissan dealer, EG Nissan, CA, where I bought the car and the fact that they said quick charging are free to their customers helped convinced me to buy it are No longer valid after April 16, 2014 is a Nissan Corporate decision. So if you ever do want to travel a little further than usual and had planned on using a quick charging station along the way, you will be in for a rude awakening that you will not be able to charge it. Even If you have a charge point card, that doesn’t work as their quick chargers are now maintain through a company NRG - ie. EVgo. EVgo charging fees are high in my opinion, requires a monthly subscription to get access to charging like quick chargers (each quick charging can cost $10.95 to charge for a 30 minute session). I found out the hard way last Saturday. Also that would make a leaf cost more than a Prius for energy. Took 20+ minutes on the phone, they ask for all sorts of information, almost like buying a car, then after signing up in hopes to get a quick charge in so I can get home, they end up telling me that it takes 72 hours to activate my account. So no quick charging for that day which I ended up needing to go to an L2 charging station for 3 hours. Very disappointed at Nissan, imo Nissan has alienated their existing leaf customers with a bait and switch on quick charging.